Since the last dessert recipe I posted was a little labor-intensive, how about I share an incredibly easy one today? These bite-sized truffles make a delicious frozen treat, perfect for serving at a party… or anytime! Just make sure you to prepare these ahead of time; they get REALLY frozen and creamy if left to set in the freezer overnight. Like mini ice cream bites! 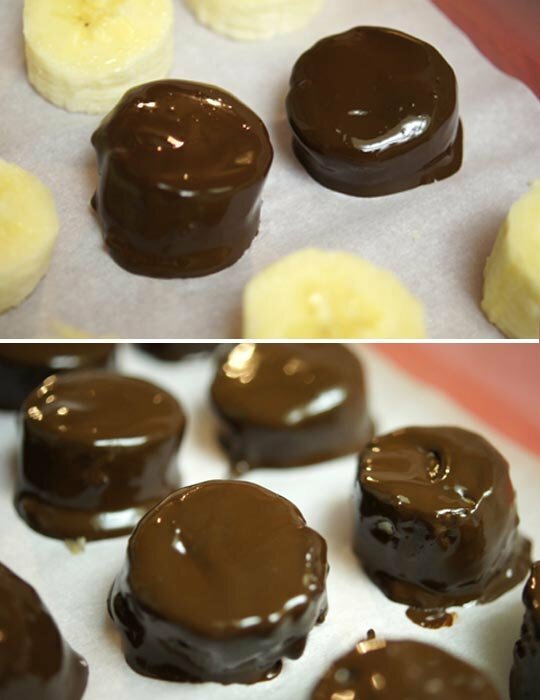 Slice the bananas into 1/2″ disks, then arrange them into a single layer on a dish, lined with parchment paper. 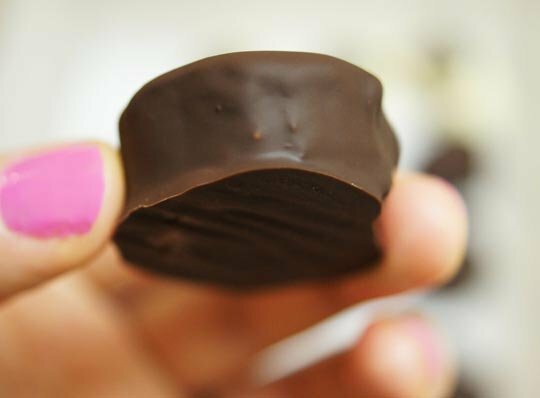 Place in the freezer to chill, while you melt your dark chocolate. 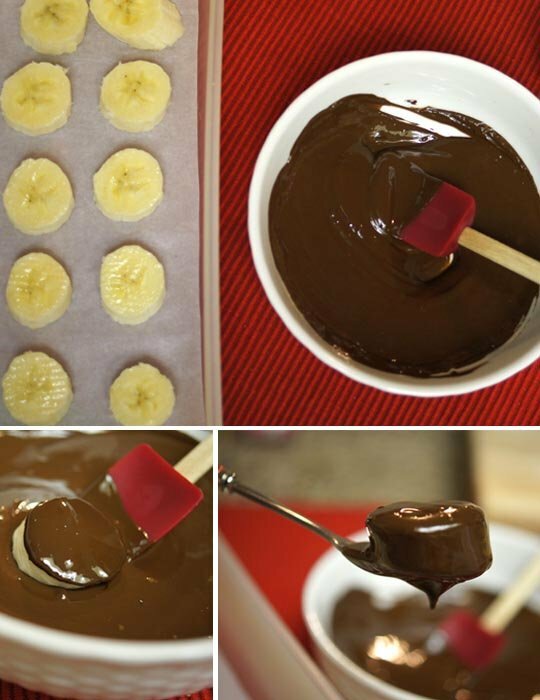 Remove the banana slices from the freezer, then carefully dip each slice into the melted chocolate, coating evenly. After coating each slice, place them back onto the parchment paper and return the dish to the freezer to let them freeze completely. The chocolate will be set within 30 minutes, but the bananas take a few more hours to get frozen and creamy– like ice cream. They are delicious either way, but I recommend waiting until they are really ice-cream-like. Preferably, let them freeze overnight! You can serve them as-is, for a fun little ice-cream treat–> but I highly recommend adding the optional peanut butter (or almond butter!) topping. 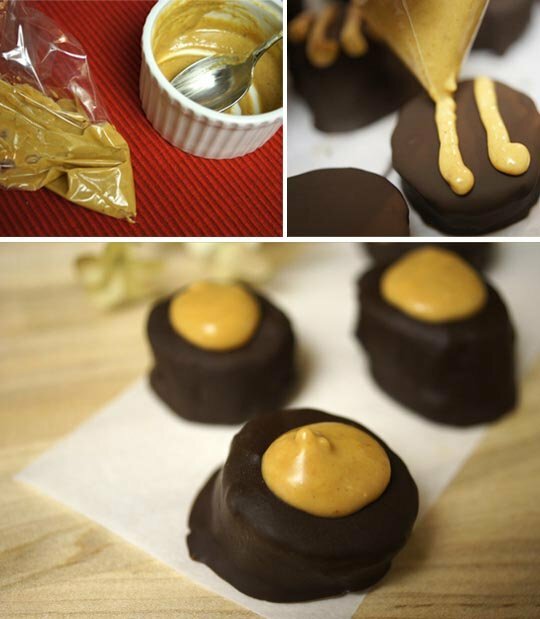 Simply mix together the peanut butter, coconut oil, and salt. Then transfer the mixture to a plastic sandwich bag, and snip off the corner to create a “piping” bag! 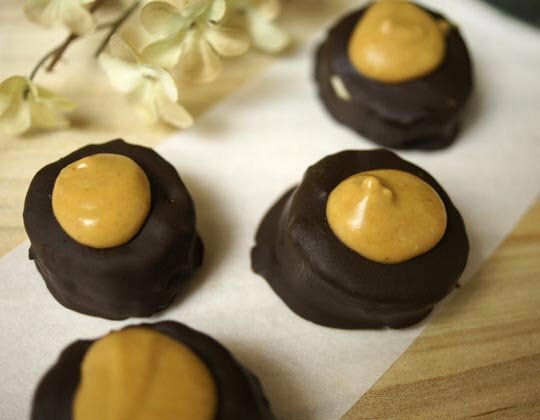 You can decorate each truffle however you like… I ended up preferring just a “blob” in the middle of each. Return to the freezer to freeze until solid, then serve chilled! Pretty enough to serve at a party, but easy enough to make often–> just the way I like it. These bite-sized truffles make a delicious frozen treat, perfect for serving at a party… or anytime! Just make sure you to prepare these ahead of time; they get REALLY frozen and creamy if left to set in the freezer overnight. Like mini ice cream bites! 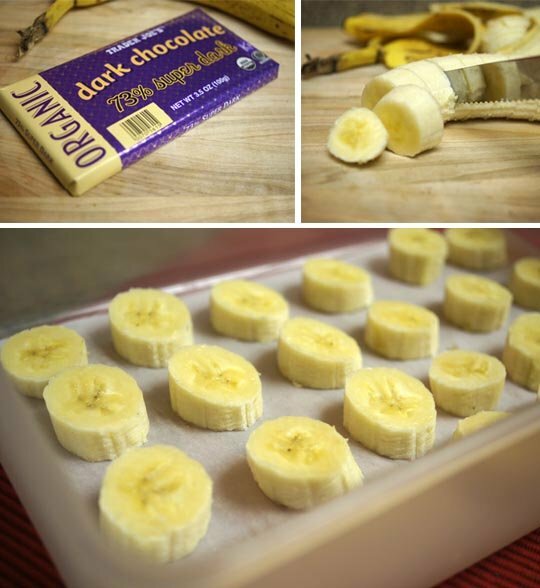 Slice the bananas into 1/2" disks, then arrange them into a single layer on a dish, lined with parchment paper. 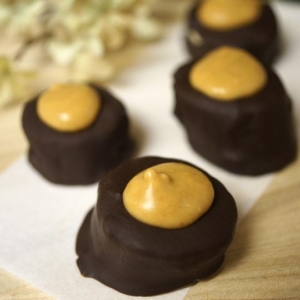 Place in the freezer to chill, while you melt your dark chocolate. After coating each slice, place them back onto the parchment paper and return the dish to the freezer to let them freeze completely. The chocolate will be set within 30 minutes, but the bananas take a few more hours to get frozen and creamy, like ice cream. Preferably, let them freeze overnight! 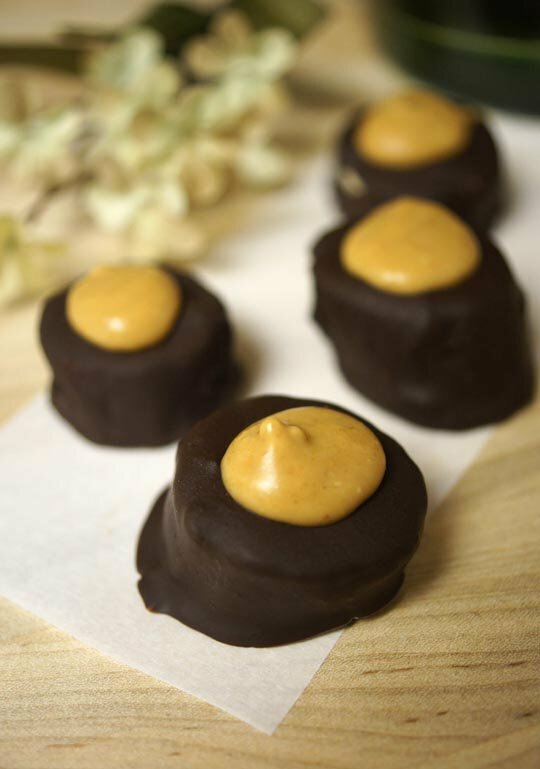 For an extra-fun ice cream treat, add the optional peanut butter (or almond butter) topping: Simply mix together the peanut butter, coconut oil, salt, and a few drops of stevia, to taste. Then transfer the mixture to a plastic sandwich bag, and snip off the corner to create a "piping" bag, and decorate as desired. Please help! I just couldn’t get this to work for me. I cut the bananas but them in the freezer for about 10 minutes while I was melting the chocolate. When I tried to cover the banana in the chocolate sauce, the bananas stuck to the chocolate sauce, falling apart. My first batch of chocolate seized, the next batch turned into a banana chocolate sauce. I ended up just pouring it over the banana pieces. I’m sure this will be a delicious mess, but it’s definitely a mess. Should I let the bananas freeze all the way before dipping them, or not let them freeze at all?